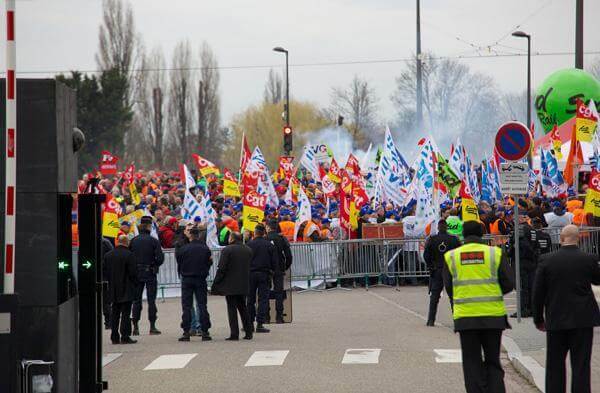 More than 4,000 railway workers from at least 17 different countries rallied outside the European Parliament in Strasbourg on 25 February, as members of the Parliament voted on the fourth railway package. If voted in, the fourth railway package could introduce competition to all public rail passenger services in every European Union (EU) state. This in turn could lead to privatisation. The package also covers the workers’ right to strike, integrated railways companies, and rail safety legislation. Despite the large activist presence the vote was not an overwhelming worker victory, although the worst proposals were modified. ITF inland transport secretary Mac Urata attended the rally. Øystein Aslaksen, ITF railway workers’ section chair, stressed the importance of keeping up pressure on the European Parliament and Council. He said that there will be further negotiations between the EP and EC, and that this is not the final outcome. The ITF and ETF alike have pledged to closely monitor any developments to the proposals. Solidarity has been shown from as far away as Korea, where workers visited the EU mission in Seoul on 20 February.